This was just another life-hack pale high school, yes? No.It was a business opportunity. It was a business opportunity. You see, when we enrolled pale St. Thomas, it was a group of lads from diverse backgrounds brought together and forced to co-exist. You were either from Nairobi or from Embu. Embu town or Embu countryside. You had come through either boarding school or day school. Private day school or public day school. If you were from a boarding school, you had some exposure to sheng. If you came through day school, you either spoke bad English or plain Kiembu. Later, and too late for relevance, I came to realize that there also were two Nairobis. Wherever you came from, we were put together in one pot and expected to boil together. Same rules. Same food. Same Deputy Principal. Nairobians, townspeople and boarding school products were sly. The rest of us were hardy. A good number of us were only for the first time wearing shoes for an extended period.An easy way to pick out a form one’s background would have been to check what brand of slippers they wore. Those from Nairobi wore either Bata blue or some other colourful spongy brands that looked like a slice of those bread loaves you buy and slice at home. I swear those slippers looked edible. An easy way to pick out a form one’s background would have been to check what brand of slippers they wore. Those from Nairobi wore either Bata blue or some other colourful spongy brands that looked like a slice of those bread loaves you buy and slice at home. I swear those slippers looked edible. Us, the day school gang, strictly wore Umoja slippers. The type that had the base no more than 0.5 mm thick and straps so long you had to march like a policeman on pass-out day to get the base off the ground. If you were being educated by the community, you wore another brand that looked like Umoja but did not have a name. The base was so brittle and usually broke like sacrament when the time came. You may also have had akala, but that was for those who had real balls and farmed absolutely zero focks. 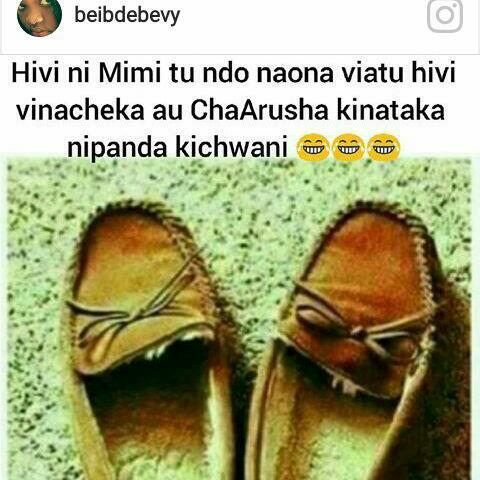 Not that it mattered anyway; three weeks into our high school life, no form one owned a pair of slippers. All had been borrowed indefinitely by the seniors, and we had to make do with un-matching pairs we collected from dustbins. Of course there was a reason they were in the bins to begin with. And that is where the business came in. While the townspeople were sly enough to come up with the clever repair trick of pinning the slippers with a piece of binding wire, they were too soft skinned and often hurt themselves in the process. So they turned to us farmhands to deliver them from the torture. In the beginning, it was just an act of brotherhood, and we repaired the slippers at no charge and set the owner on their way. But when the requests became too frequent, the Hardy Boys started declining. They said it was taking up too much of their time. Many departed the trade and only a few of us were left. I think we were only four in a form one class comprising over 200 students. Soon, the load became too much for us also. At times I entered the class for evening preps only to find a pile of slippers at the foot of my desk. I didn’t mind getting down to the task, as it meant I could stay busy throughout the three strenuous hours without having to make noise or fall asleep. It is the clients themselves who introduced money to the trade. In an effort to get served before their peers, some started offering tokens. Five shillings. A spoon of peanut butter. A bite of biscuits. For the better-connected ones, it could go as far as a slice of avocado during meals. Soon, the payments ceased to be voluntary tokens of appreciation and became standard requirements of service. If you did not pay, your slippers just sat there; I did not touch them. I ended up with a pile like you will find at any other fundi’s. The Hardy Boys who had departed the trade tried to come back, but we had already secured clients’ loyalty. Also, our skill was far much developed. To stay ahead of the game, I started spending my free time cutting down pieces of wire from the school fence to aid my clippings. The demand was overwhelming, and in the process, I ended up making a hole in the fence that was used by truants to get away. Without any tools, the method of cutting wire was twisting it until it got hot and soft so you could tear it like a banana peel. This often caused burning to the fingers; I have a black spot to date. My fame as a cobbler grew, and I was soon contacted by the seniors to get their slippers done. Mostly it was form twos who had not shed their form one clumsiness, but at some point, I got so good that even form threes and fours recruited me. The downside of working for the seniors was that they didn’t pay. They were also very strict and demanded that my repairs should not allow any water to leak in between the toes when they walked on wet surfaces. That was practically impossible when you worked with wire. I, however, got some kickbacks like listening in on their tales or not having to scramble for food with fellow first formers. I, for a moment, mooted venturing into full-scale shoe repair, but I quickly went back on that idea when my first pair ended up like a certain pair of shoes in this post. I recalled it immediately after roll-out. My business came to a sudden collapse when the first batch of Chinese landed in Kenya. They brought with them cheap sandals that were affordable, available and acceptable to all categories of students. Not that I cried over the new development; I had ventured into other forms of business anyway.